Start by peeling the carrot, removing the ends. Then, slice the carrot into segmented lengths of 4cm (2in.). Taking one of the segments, you will slice one end to produce a flat surface. This surface will then be laid flat, and you will continue the process for remaining sides. Your carrot segment will come out looking like a 3-dimensional rectangle. Now that you’ve squared off your carrot, you’re ready to start producing the type of cut you’re after. The julienne cut is a type of stick-shaped cut that is very thin. Cut from a squared off item, you will then slice that item length-wise at a thickness of 1-2mm (1/16 in) leaving you with thin rectangular cuts. Then, take the thin slices and apply the same technique. You will end up with Julienne (Or matchstick) cuts! The Brunoise dice is the smallest dice you can have. While you can mince to a smaller dimension, this method refers to the smallest uniform size available for dicing. This method is simple and only adds an additional step to the Julienne method. Take your julienne cuts and bunch them up with your hand. 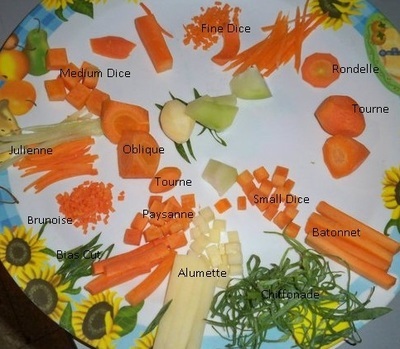 Then cut the julienne into equally shaped dice. That’s it! While simple, it does take a long time to master. Get crackin’! The small dice is similar to the brunoise, but it is slightly larger. Start by following the steps to Julienne your item. You want to slice your squared-off item at a thickness of 3mm. Now it’s only a matter of finishing off the dice as you would the Brunoise! You’re probably starting to notice a pattern here. We start with squaring off our item, slicing it to the thickness desires, and then going from there. Let’s continue. The Batonnet is no different, and we are aiming for a larger stick-cut. The batonnet is used when serving a larger potion of an item such as a vegetable side, to gain height in your dish, or to provide imposing linear appeal to an otherwise linear-absent dish. The medium dice is derived from the Batonnet and the only added step is slicing the batonnet to produce cubes. This size is called a Medium Dice. The batonnet is the largest stick-cut you can cut. It is used for crudites and for presentation purposes. While not used as much as the rest, it is the foundation for the more common Large Dice. The large dice is primarily used for stews, long-cooking dishes and for mirepoix in stocks. The large dice is important, because it is relatively quick, has a great imposing nature and looks professional. When cutting a large dice, you will tend to have a higher waste when trying to get nicely cut pieces using the method describing how to square off your item. Remember when doing any cutting or dicing to use the method best suited for your dish. Dimensions: 12mm X 12mm X 12mm (1/2 in X 1/2 in X 1/2 in). The paysanne cut is included here to show you that while cubed items are common, sometimes you would prefer a slimmer, flat, square item. This is called the Paysanne. This is achieved by creating your desired stick-cut size, then slicing thinly to produce a thin square. Typically used for larger cuts, this method can be applied to smaller cuts and dices as well. The chiffonade is used when slicing very thin items such as herbs or leaf vegetables such as spinach. Cutting en chiffonade is a really simple process. Start by stacking the items you are looking to slice. Then roll up the items, producing a cigar-shaped roll. Once it’s rolled, start slicing to produce a nice chiffonade suitable for garnishing and other purposes. Would you take the ALS Ice Bucket Challenge? What is your favorite Robin Williams TV show ?